Battery Life in the Garmin Astro 320 Handheld. The stated handheld battery life is slightly less on the 320. It still uses AA batteries and Garmin is saying less than 20 hours from a set. I'm assuming that's got to do with all this stuff they've added. The screen is a little different. The backlight is a little stronger. The color is a little different. The base map is a little different. Use of the vibration motor is going to affect battery life. From what I can tell, these added features are really going to drain your standard AA batteries faster. Just with regular use, I keep getting warning messages that my batteries are too low for the constant backlight feature. 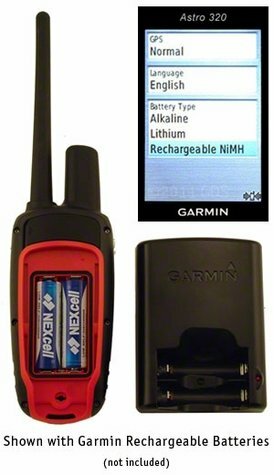 I think that looking into the use of Lithium AA batteries or the Garmin rechargeable batteries may become a bigger issue with the 320. I have used Lithium Batteries in my 220 and I am testing rechargeable AA's now. I have been pleased with both and I expect more folks will try them out in the 320 handheld.